25 years ago – April 1994: I only raced twice during April although I managed 368 miles with no days off. I was recovering from a sprained ankle and back woes which kept my racing limited. I supported U-Lowell at the Alamo Alumni race in Boston. It was sunny but windy and a chilly 40 degrees. I ran an uninspired 24:37 to take 10th place. I stayed away from racing until the 23rd when I went to the Mount Misery trail race in Lincoln MA. The trails were in great shape, but the field was very small (26 finishers). I ran with Petey until the last quarter mile then took off to win in 43:22 for the 7 miles race. 20 years ago – April 1999: Another month with a badly sprained ankle which caused me to miss a day. I managed 346 miles and raced three times. First up was the Red Shoe Barn 5m. I went out with the lead group (teammates – Richard Bolt & Tom Anderson, along with Chris Teague and Mike O’Brien) and stuck with Teague through 2 miles. He broke away and went on to beat me by 15 seconds (24:26 to 24:41). O’Brien and Anderson finished under 25, running 24:52 and 24:59 respectively. A week later I headed out to Worcester for the Fred’s marathon/half-marathon. 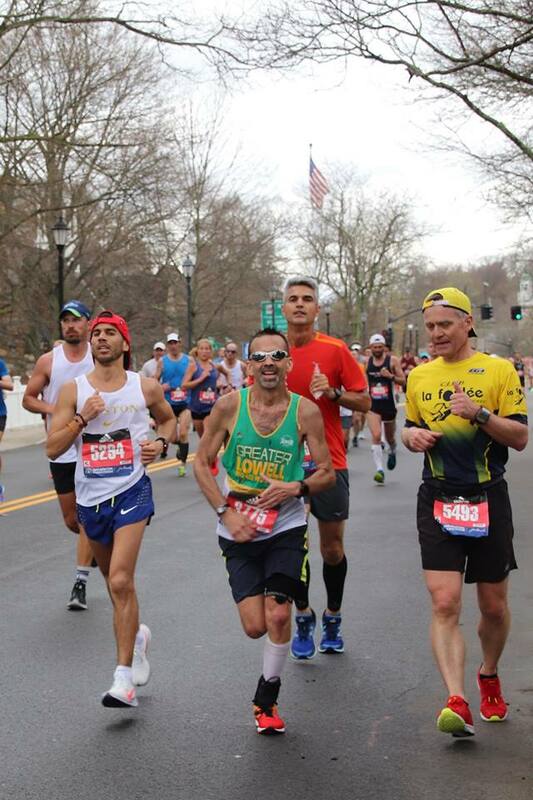 Alex Tilson, who had raced me the year before at the Baystate marathon, was looking to run under 2:22 and asked me to lead him through the half. I ran an evenly paced 1:10:48 to win the half with Tilson in tow. He ended up missing the standard but set a CR with a solid 2:25:23. The final race of the month was the Groton 10k, which was a CMS goal race (they had a team prize). It was sunny, breezy and mid-60s as the pack of about 6 of us hammered the first 5k. Teammate Richard Bolt and I broke away with GLRR runner Chris Teague. I gapped them on the uphill from 4-5 miles and held on for a 12 second win in 31:08. For some reason Richard and I were not included in the team scoring for CMS, we took the team title anyway with five other CMS runners in the top 10. 15 years ago – April 2004: Nothing much of note from this month, I ran 340 miles with no days off and raced twice. I was working my way back to “racing shape” and started the month with the Bow Lake 15k. My goal was to run 6 minute miles (56:00). The course was quite hilly, but I managed a fourth place finish in 56:19. Two weeks later I took on the Muddy Moose 14 mile trail race. My Achilles was bothering me, and I never felt good. I ended up taking 6th place in 1:40:27. I led the race for the first 1/2 mile then heard footsteps. The guy trailing me blew by me on the long downhill after the tower. I kept close and pulled back even with him about 3/4 mile into the race. It was good to have someone to work with. We hit the mile in 5:16, which I knew could not be correct (with the hill and wind there was no way I went out in 5:16). We stayed side by side for the next mile and hit 2 in 10:42 (5:26), still short of 2 miles but maybe the second mile was about a mile long? We had a slight tail wind for the third mile and hit that in 15:55 (5:13), which again seemed too fast (short). Just as we hit 3 miles the guy took off and I just couldn't respond. I kept him close over the last .75 but ended up in 2nd place about 4 seconds back. I heard a few other people mention that the miles were not right but that the distance was "close". The course is used for a summer series as well (although they start further up and a few people mentioned 3.8 as the correct distance for the loop we did). I was hoping for sub 1630 and tried to head out strong. Stephanie Reilly led for the first 400 then I moved into the lead with Eric Lonergan (who won last year in 1555). We ran side-by-side through 3km then I got a stride on Eric. It was short lived as he blew by me at 2 miles. He had about 3-4 seconds on me by 4km but I slowly reeled him back in. I figured my only shot was to get ahead of him before the final 400 or I'd get out-kicked. Unfortunately (for me) I couldn't get a lead and only just barely caught him as we hit the 3 mile mark. He put the hammer down at that point and beat me by 4 seconds in the last .109, even with me hitting 31.8 for that last part. I was pleased with the effort but not so much with the time. I guess the breeziness and the warmth (70s) were part of it, or maybe it just wasn't my day. Either way I took some solace in getting $150. 5 years ago: April 2014 – I struggled all month seemingly stuck in some sort of training rut. I finally went to the doctor after a terrible run at the James Joyce Ramble 10k and found out that I had walking pneumonia. Well that explained a lot! 30 years ago – April 1989: I lowered my mileage down to 328 for the month, mostly because I was aiming for a good run at the Boston marathon. This was my first shot at the marathon and I trained very hard with a goal of breaking 2:15. The week prior to the marathon I headed to New York City for the second annual Ekiden Relay. This was a big money race that had teams from each of the 50 states and some international teams. Somehow, I ended up running the shortest leg of the relay a 7.5km (4.41 miles) dash through Central Park. I ended up running the 2nd fastest time of the day 20:44 (4:42 pace), our team took 4th place and I came home with $3,000. The others on the team were Tim Gannon (14:10-5k), Paul Gorman (10.1k -9th pl), Dennis Simoniatis (9.3k-2nd pl), Wally Collins (10k 30:12, 10th pl). 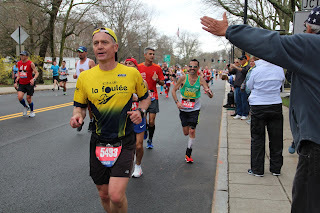 Nine days later I lined up at the start of the Boston Marathon. This was my first and only (?) 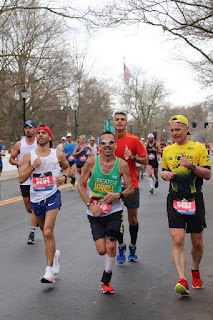 Boston and my first Marathon, although I’ve done 50 races of the marathon and beyond since then. I joined 5,122 others on a 67-degree day. I felt great through 20k, and still pretty good through 30k, but the last 10k was just brutal. My splits were 31:10, 32:10, 33:10, for the first 30km. The last 12.2k took me 45:32 (5:59) pace but it was a lot worse than it sounds. I staggered across the line and was promptly escorted to the medical tent and from there to the hospital. Over 10 pounds of IV fluid later I was released. Ouch! I ended up finishing in 2:22:03 for 17th place. 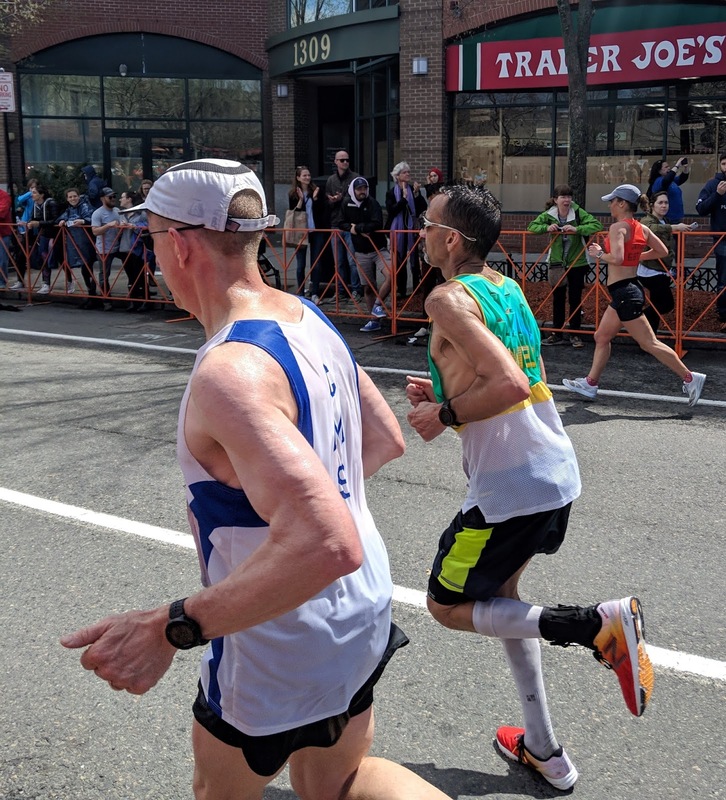 I would not recommend training for a marathon the way I did for the 2019 Boston marathon. Since you have to sign up for Boston nearly a year in advance, anything can happen leading up to the race. I decided when I signed up that I'd either race it all-out and try to do well in the 55-59 age group or I'd just go and have fun. Whichever one I did would depend on my training. 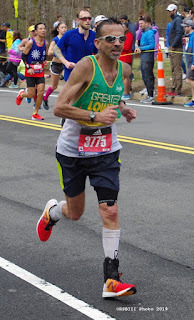 I ran the Baystate marathon last October with the hopes of a 50+ PR (2:57:10) but ended up with an injured ankle and hobbled through the final miles in misery. After that I had a steady stream of injuries that didn't finally loosen their grip until last month. I spent most of the final part of 2018 trying to recover and then get back to racing in 2019 (I didn't race between Baystate and March). I put in some decent miles (the last 10 weeks averaged 80 miles per week) but was sorely lacking in long runs. In 2019 I did TWO runs longer than 10 miles (a 12 mile in Feb and the New Bedford 1/2 marathon in March). Not exactly what you want to do to get ready for a marathon. My goal would be to just finish but I wasn't even sure that I would START the race until a few days before. I did not want to aggravate my already aggravated ankle. Now that I'm running and racing again I want to continue doing so. My goal for race day was to run under 3:30 (8 minute mile pace). I thought I could run as fast 3:15 if conditions were good and I didn't have any issues. Dave La and I met up on race morning and got on the GLRR bus in Lowell for the rainy drive to Hopkinton. GLRR had things dialed in and all we had to do was sit back and relax. Dave was aiming for sub-3 but was back in corral #8. I was in corral #4 so I figured he'd go by me about 6 miles. We walked most of the 1.4 miles to the start together and then went on our separate ways to line up. I got in the back of the corral and had about 15 minutes to stand around before the start. I chatted a bit with a guy from Houston as we killed some time. National anthem then flyover, then off went the elite. Two minutes later we started, and 1:30 later I was past the start line. I tried to relax as literally THOUSANDS of people moved around and past me. It was tight but if you kept your wits about you it wasn't too bad. You just had to be extra careful at water-stops when idiots would sprint, swerve, or even stop! I reached the mile in 7:09, so well ahead of schedule. It is a downhill mile and it felt very easy. I figured 7:30's was probably going to be slower than I wanted to go but would just stick with whatever felt good. It was difficult to judge pace as EVERYONE was flying by me, so I just dialed in on how I felt and kept it relaxed. Miles of 702,710,701, and 717 got me to 5 miles. My posterior tibial tendon was really bothering me now. Ugh! So early in the race and it was flaring up. I moved to the middle, the left, and the right of the road trying to find what might make it hurt less. I also started figuring "if I can get to 15 I can stop when I see my parents and sisters". That'd be the worst case. Soon after that my foot stopped hurting and that was it. Nothing else hurt for the remainder of the race. The next 5 were covered in 708/809/713/705/715. I felt good and kept thinking "don't pick it up until 16". Something about 10-to-go makes it easier to manage. Another 3 miles in 716,710,714 got me to the half in 1:33:55. I was having a bit of trouble with the math as the clocks on the course were from the 10am start so I was looking at 1:36 when I crossed the half-way. I was pretty sure I'd be under 3:15 and thought that with a strong second half I might even crack 3:10. The next milestone was seeing mom, dad, rose, and denise who were enthusiastically cheering for me at the 15 mile mark. I had been getting a lot of cheers "go GLRR" and "go Lowell" which was nice. I was also starting to feel very good despite the high 60 degree temps and humidity. Maybe it was because after 10 miles very few people passed me and by 13 I was starting to pass people. I was also moving a bit quicker despite the hillier terrain. Spilts of 658,717,650 had me moving by people. Dave La finally caught me at 17 and then went by at 18 miles. I wished him good luck as his pace was too fast for me. Miles of 718 and 713 still had me passing people as we turned the corner at 18 miles and had 3 more hills. I watched Dave pull away and concentrated on getting to 20 miles and beyond the "wall". A 657,713 and 718 had me at the top of Heartbreak hill and ready for 5 miles of cranking downhills. The toughest part of the hills was navigating between people at all paces from walking to barely moving. I was doing the math now for slowing to 7:30's but a 650 and 657 got me to 22 and back to Dave La. We locked in together sweeping by a lot of people as I ran my fastest miles of the day (651, 658,654). I turned on to Herreford street with Dave but he went into a finishing kick that I could not match. It was good to have a teammate to run with but I couldn't muster that extra something at the end. Dave (who started a couple of minutes behind me) finished in 3:03 while I came in very satisfied at 3:06:15 (7:08 pace) well under my goal and more importantly it didn't seem like I did any additional damage to my ankles. So, I'm done with Boston for at least another 30 years. I must say it was a lot of fun but not something I'd want to do very often. There are so many other races out there I'd like to do. Next big goal will be a sub-3 in 2020 which would give me 5 decades under 3. 40 years ago – April 1979: I ran 127 miles and took 7 days off during the first full month of outdoor track during my freshman year at Billerica High School. I raced six times, mostly in dual-meet races. I started the month with a third place 2 mile versus Central Catholic (11:47). Five days later I lowered my PR by nearly a minute running a 10:50.4 and placing fourth in a meet against Dracut on our home track at the Marshall Middle school. Two days later I ran a 11:00 2 mile against Tewksbury and followed that up a week later with a 10:58 versus Wilmington. After that I ran a 2:25 for a half-mile leg in the Class Relays. I closed out the month with an uninspired 11:18 2-mile in a dual meet against Andover. In all I scored 14 points towards my letter. I’m not sure how many points you needed but I ended up getting the outdoor track letter (a large green “B”). 35 years ago – April 1984: I only ran 255 miles with five days off due to a badly sprained ankle during the start of my sophomore outdoor track season at the University of Lowell. I opened the month with the Fitchburg relays 5,000 meters. We used to call it the “iceberg relays” because it seemed to always be cold and rainy at this early season meet. Dennis Simoniatis and I planned to tie, doing the race as a hard workout. We ran splits of 4:41, 4:48, and 4:38 for a 5k of 14:32. Twelve days later I ran my first 10,000 meter track race at the BC relays. My goal was to break 30:30 which was the qualifying standard for the NCAA National championships (D2). I ran splits of 4:44, 4:50, 4:49, 4:50, 4:52, 4:56, and 70 for a 30:12. That put me over a minute behind the winner (Sapienza 28:55). I tapered down to 78 miles for the week (from a high of 80). Feeling okay. My April course records have both held up another year. I keep track of any course records I have for races that are still held and the course is still the same as when I raced it. The Red shoe barn 5 mile was held this weekend and my 24:12 (24:11.01) from 1996 survived another year. The race has now been held 38 times and my record has held for 23 years. The Chicago Lakefront 50k was held early this year (03/30/19) and my 2:57:36 from 2001 was 25 minutes faster than this years winning time. This was the 20th running of the Lakefront race and the 18th year my record has survived.